Congratulations to our Client PHIVEbar for their feature on InTouch Weekly! PHIVEbar is a delicious nutrient-rich superfood bar made from nature’s best ingredients. Each wholesome ingredient is selected for our modern lives blended into one sublime, on-the-go superfood that is ridiculously nutritious and supremely tasty. Wholesome, nutritious and loaded with flavor, PHIVEbar is derived from an ancient recipe using the PHI ratio — a unique ratio found within nature. Every single ingredient is selected for its role in better health with nothing extra added. PHIVEbar is a distinct blend of fruits, nuts, and seeds that work in synergy with your body. More than just a bar, PHIVEbar is food with a purpose. NFL quarterback Kyle Boller and his wife, former Miss California USA, Carrie Prejean Boller, set off on a quest to make the world a healthier place, one bar at a time. Carrie’s father was battling Stage 4 base-of-tongue cancer, and miraculously the couple found out first-hand how a diet consisting of whole foods and water helped heal her father. When he embraced a new organic way of life, PHIVEbar was born. 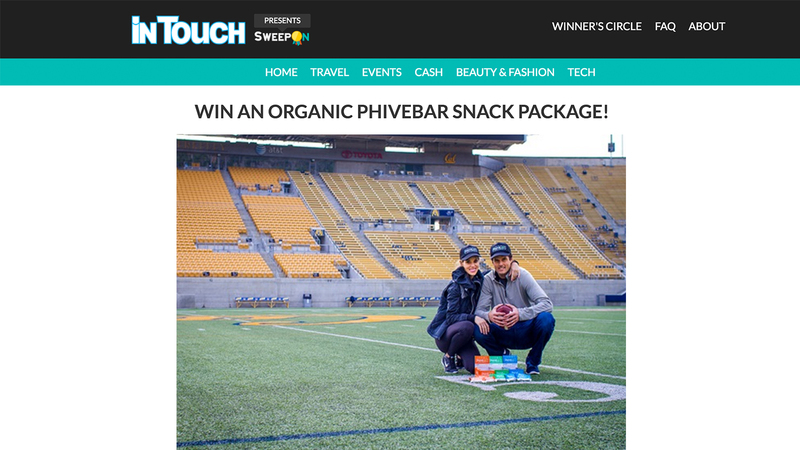 Check them out at phivebar.com and head on over to InTouch Weekly for your chance to win a box of each PHIVEbar flavor!